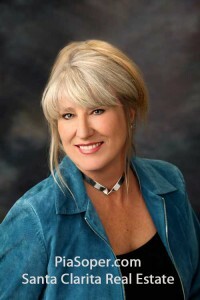 Meet Pia Soper, your local Santa Clarita Real Estate Agent! Originally from Canberra, Australia, Pia made her home in Santa Clarita in 1981 after meeting her Texas raised husband in Saudi Arabia. She studied microbiology and chemistry at the Australian National University and music at California State University Northridge. She began her real estate career in 1988. Her kangaroo logo is recognized widely as belonging to a local Santa Clarita real estate agent and Realtor with Australian beginnings, and if you are wondering what “Wahroongah” means…..well, it is an Australian Aboriginal word meaning “Home”. Whether you are buying or selling a home or an investment property in the Santa Clarity Valley, it is important to choose an experienced and local Santa Clarita real estate agent who can help you avoid expensive and unnecessary pitfalls. As a top Santa Clarita real estate agent and Santa Clarita Realtor with over 25 years experience in the area, she can help you make the best decisions to achieve your goals in the shortest time possible. She has an extensive knowledge base of all areas of Santa Clarita – Valencia, Canyon Country, Stevenson Ranch, Saugus, Newhall, Castaic, and the rural areas of Agua Dulce and Acton. If you are looking for Santa Clarita Valley luxury custom homes, horse property, land, or the tract homes of Santa Clarita, Pia has the experience to help you find your way through the process with her easy going but persistent attitude. Problems are either avoided completely or dealt with promptly. Sellers: A well planned and fully executed marketing plan which will sell your home for the highest price possible, in the least amount of time, with minimum hassle to you. Please allow her to show you a marketing plan that will work for you. Buyers: A thorough understanding of the market place prior to purchasing your new home. Knowing whether a market is favoring a buyer or seller is not enough. Please allow her as your Santa Clarita CA agent to provide you with the greatest chance to have your offer accepted. Experience Matters – don’t just “happen to find” a local Santa Clarita real estate agent. Work with an experienced Realtor who has the knowledge and experience to make your sale or purchase a hassle free experience! Call Pia Soper, Realty Executives Valencia at 661 645 5556 when you begin your search for a new home, or are thinking of selling your current home.